New York City's transit agency loses millions of dollars each year because of people who don't pay to ride the subway. Photo by Adam Fagen. 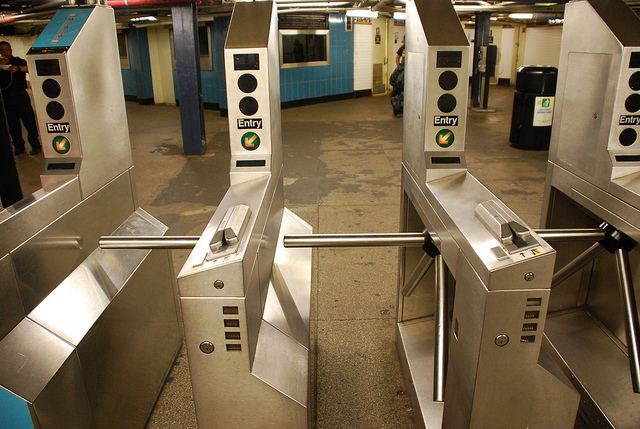 An unofficial study by New York City’s Metropolitan Transportation Authority found that 40 percent of all metro fare-evaders are children taller than 44 inches who duck under the metro turnstiles. New York City’s metro rule is that children under the height of 44 inches are permitted to ride the metro free of charge. According to the report, each year the illegal activity of fare-evaders costs the agency millions of dollars in lost revenues. The remaining bulk of toll-evaders are individuals walking through exit gates (24 percent) and individuals that either jump the turnstile or enter the metro with another passenger using only one farecard (32 percent). The number of hydrogen fueling stations operational worldwide will increase from 200 stations in 2010 to 5,200 in 2020, according to a new report by Pike Research. Pike calculates that the annual investment in hydrogen stations will reach $1.6 billion by 2020 and the global demand for hydrogen fuel will reach 418 million kilograms annually by 2020. Hydrogen fueling stations are for use by cars, buses and forklifts. The U.S. Bureau of Transportation Statistics released the results of a survey on American attitudes towards transportation, which indicates that younger people value non-motorized transport infrastructure more than older people. The survey asked respondents how important several transportation options or features are to have in a community. In regards to sidewalks, 92 percent of 18- to 34-year-olds found it to be an important facility, compared to 73 percent of respondents 65 years of age and older. Nearly 74 percent of younger respondents found bike lanes important, compared to nearly 52 percent of older respondents. Attitudes between age groups converged more when it came to motorized transportation options, with the majority of younger and older respondents agreeing that public transit options and major roads are both important. The Metropolitan Planning Council of the Chicago metropolitan area will release a new report highlighting opportunities and recommendations for a Chicago bus rapid transit system (BRT), including the top 10 routes in Chicago where BRT is feasible. The report is based on the Institute for Transportation and Development Policy’s report, “Recapturing Global Leadership in Bus Rapid Transit,” which will be released by MPC at an event on August 17. The launch event will include presentations from Enrique Peñalosa, the former Mayor of Bogotá, Colombia and the president of ITDP’s Board of Directors, and Gabe Klein, the transport commissioner for the City of Chicago.